A judge unsealed grand jury transcripts earlier this week in a case about the death of a 10-year-old boy whose parents allegedly tortured and killed him after he came out. Earlier this year, Anthony Avalos died after what investigators described as years of torture at the hands of his mother, Heather Barron, and her boyfriend, Kareem Leiva. 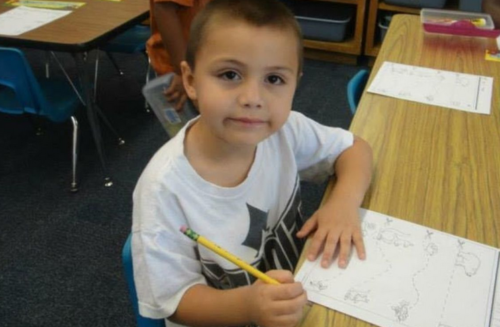 The director of the Los Angeles Department of Children and Family Services (DCFS) said that Anthony had “said he liked boys” in the weeks leading up to his death. The prosecution’s case involves both physical evidence and witness testimony. Assistant district attorney Jonathan Hatami told the grand jury about the coroner’s report, which found injuries all over Anthony’s body. “There were injuries to Anthony’s side and his hip area, both his left hip and his right hip, and his arms, and even injuries to his feet,” Hatami said. There were also abrasions to his knees, circular marks on his stomach and torso, and bruises on his face, and blunt force trauma to Anthony’s brain and his body. The grand jury also heard from Anthony’s 8-year-old sister, whose name was not released. She described horrific abuse that Leiva meted out mostly to her, Anthony, and another brother. She said that the kids were often forced to kneel on rice. Both of the parents would punish them with the rice, and sometimes Leiva would push on their knees with his foot. The girl said that she was forced to clean up the rice. “Was there any blood on the rice?” the prosecutor asked. “Yes,” she responded. “One time, Kareem dragged [Anthony] on the carpet and he got a rug burn,” she told the grand jury. The kids were also sometimes forced to stand in a corner for hours after they got home from school. “Sometimes we would like go in the hallway, the little wall between my room and my mom’s room, we would have to go there on our knees and carry books and with two weights on top tied all together and we would have to hold it for like ten minutes,” the girl said. If the dropped the books, they had to start over for another hour. The parents also beat the kids with belts, according to the sister, and the prosecutor said there was evidence that they were hit with power cords and vacuum tubes, as well as by Leiva’s fists. Leiva would also have the kids beat each other. The sister talked about how food was used to punish the kids. It was often withheld, and sometimes they were forced to eat things like a raw corn tortilla with peanut butter on it. “Kareem would time us for two minutes or five to eat the tortilla or sandwich and if we didn’t get it on time because it’s nasty we would get sriracha or Tapatio on it,” she said. Leiva put an alarm on the boys’ bedroom door because he caught them sneaking out to look for food at times when he was starving them. They weren’t let out, even to use the bathroom. If they soiled themselves, they had to either sleep in it or on the floor. “Kareem would hold their legs, make them lay down, and put their face in the pee,” the sister said. Last, she talked about the days leading up to Anthony’s death. Barron found Anthony “acting weird” and saying he wanted to sleep. Later she noticed that he wasn’t breathing. The next morning, Anthony wouldn’t wake up and Barron called 911. He died the next day in the hospital. When police showed up at their house, the girl said that she lied to them because her mother told her not to talk about Leiva. Barron said that Anthony’s injuries happened because he fell. The prosecutor said that Leiva was primarily responsible for the injuries, but Barron also beat the children and did nothing to stop Leiva. Hatami also said that she should have taken Anthony to the hospital earlier. Body camera footage of a deputy talking to Barron after Anthony’s death was also released. When she is told of some of the allegations of torture, she scoffs. The date of the trial has not been set. Bail is set at $2 million each for Leiva and Barron.